Update 2: Just purchased a new 4G USB modem E3372 LTE/4G 150 Mbps USB Dongle and am now getting close to 50Mbps download on Vodafone, maybe I won't need FTTC when it finally arrives! Update: I've now added a MIMO 4G antenna to my set-up which improves signal strength and stability. 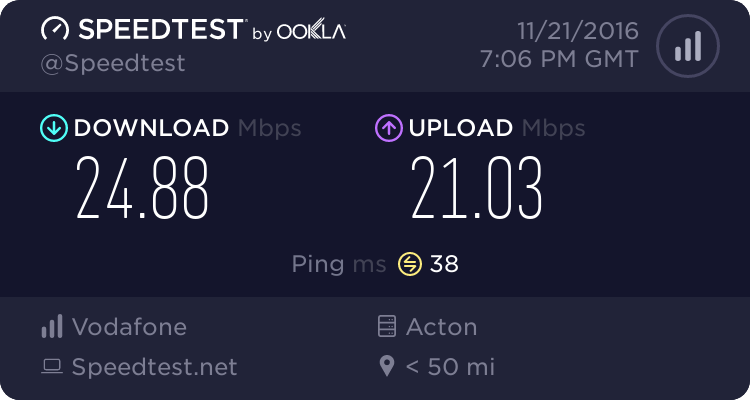 I've noticed an improvement in stability (staying connected) and also speeds have improved to around 30Mbps. So the date for the 'superfast' enablement of my village exchange, Coldingham, moved again. Without even a hint of being kept 'in the loop' by Digital Scotland, the date quietly slipped again to January - June 2017 and a request for more information via their website produced a reply (after a month - a month!) that said "The predicted timescale for Coldingham exchange is January – June 2017". Genius. Glad I waited a month to be told exactly what I could find out myself from the website. So after talking about it for a while, I've decided to take matters into my own hands. I'd been dabbling with 4G connectivity for a while, we're lucky to be served by both o2 and Vodafone with reasonable signal strengths from both networks. The problem being, how do you distribute a 4G signal around the house, and how much do you want to pay for the pleasure - Mobile data has historically been quite an expensive form of everyday connectivity. Step up Vodafone who are now offering 50GB of data allowance for £25 per month. It's not cheap, but a quick word with their retention department saw that come down to £20. I got in! 50GB of usage is half what I get with my fixed line provider (A&A) but it would be enough if I split my usage between the 2 'lines'. This is where working for a networking equipment manufacturer comes in useful. Using my existing network hardware I can split my Internet traffic between the 2 providers on a per device basis. This means my laptop and TV can use the 4G, while my tablet uses my fixed line broadband for example. Where I need the extra download/upload speed I use the 4G, leaving the less important devices on the slow fixed line. All of this works seamlessly over my existing WiFi and if one link fails, all the traffic moves over to the working link. For anyone interested, I use Internet traffic shaping on a Meraki MX65. I also use a Huawei 4G dongle attached to a mobile router (Meraki Z1), placed high in the loft to get the strongest 4G signal, and this is ethernet connected back to my main router (MX65) which performs the link sharing. 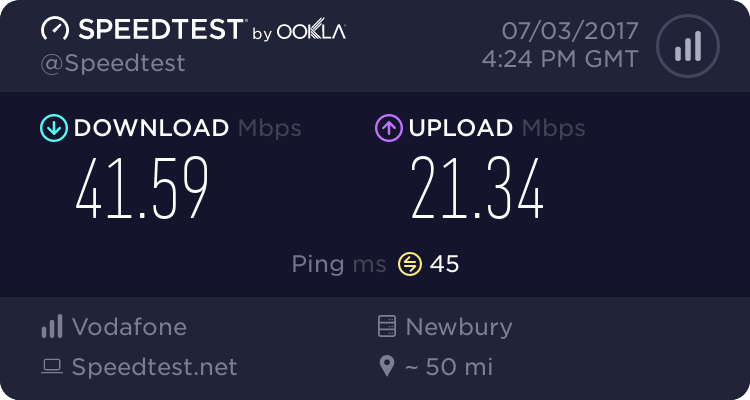 For now I'm happy to pay for both links as it gives me the redundancy I need to be able to work from home without interruption, but it also gives me a huge boost in speed which BT are still not able to offer. A speed test of my new 4G link - 4.5X faster download and 30X faster upload! Where previously I had a 5.5Mbps download speed and a paltry 750Kbps upload (and I have to pay extra to get that!) I now have access to 20Mbps download AND upload via the Vodafone 4G. When working from home, that extra upload speed is really very useful, and saves a huge amount of time. So BT, Openreach, Digital Scotland - you're too slow, you don't give people enough information about what's happening, and you can't tell me what, if anything, I will receive when you do finally get your act together. Until then, I'll use my own knowledge and skills to help myself and others in Coldingham to get faster rural broadband. So December 2015 came and went, and despite asking to be "Kept in the Loop", Digital Scotland quietly changed the estimated due date for 'fibre' broadband in Coldingham to June 2016. I don't call that being "kept in the loop". Still, we're told constantly that with an engineering project of such size, scale and complexity that estimated dates do change, and I accept that. However, people who are given information can make well informed decisions. Decisions such as: Should I invest in a 4G solution to boost my home broadband speeds? or Should I sit it out and wait for Digital Scotland and Openreach to build the 'fibre' infrastructure? If I DO sit it out and wait, what kind of speeds should I expect? Where will the cabinet likely be? Will Openreach be deploying any Fibre to the Premises? One would hope that as the winning contractor for the Digital Scotland project, Openreach are providing regular updates to these kind of questions to their customer. So it wouldn't be too much of a stretch expect that those updates are in turn passed onto the end customer, the tax payer, the people actually funding much of the roll-out - would it? Well, it seems that despite me asking before Christmas, there is no news from Openreach on the status of Coldingham exchange. It worries me that if a simple request for information takes longer than 6 weeks to turn around, what hope do we have that such a complex and sizable project is being managed efficiently? I suspect that the 'status' information I receive won't be much more than I'm about to tell you here. For those of us waiting, it remains for me to dig for information myself and cling to any snippets that come from 3rd party sources. One such place is the CodeLook website. Try entering 'coldingham' as a 'locality' and follow links for 'All Exchanges' then 'All Fibre Cabinets'. Take the information here with a pinch of salt, but for the 2 cabinets that we are expecting (St Abbs and Coldingham centre) it looks like we are in the Field Survey phase. A phase which means Openreach engineers are in the village looking at where to place equipment and ensuring that their design plans from the previous stage match with the reality on (and in) the ground. It's the 3rd of 7 phases that lead to a full operating service and they are described here in more detail. You'll also see that October is mentioned as a go-live date, I'm not sure how accurate that is, but I'm inclined to trust it more than the June 2016 date mentioned by Digital Scotland. However, don't expect to find this intricate level of detail on any Digital Scotland, or Openreach website, if knowledge is power, then we're living in the dark (ages)!